Welcome! Does your library think about individual and organizational improvement? Capacity building? Learning organizations? To me, a Fast Forward Library cares deeply about all these things! I started this project as a division of my nonprofit consulting practice because I’m passionate about helping libraries grow and increase their impact through organizational development. I want to help libraries become more strategic by taking time to reflect, learn, and plan. So why Fast Forward Libraries? Fast is a nod to one of my favorite publications, Fast Company. I’m always inspired by their articles and ideas and find them relevant to libraries. I was an early subscriber and always made sure the libraries where I worked had it on the shelf. Forward is where I want libraries to go. 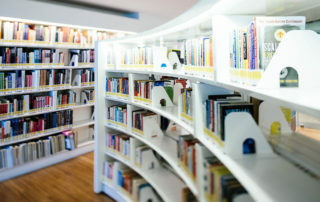 I love thinking of libraries as a movement, as a community organization that can improve the lives of individuals by connecting them with resources vital to their advancement. Libraries move entire communities forward by providing services that users didn’t even know they needed, but add to the quality of their lives and permanently change their habits and relationships. Forward is progress. Libraries are everything. There are few problems that the library can’t help solve. Lonely? You can meet people at the library or just sit quietly in the company of others (including characters in a book). Entrepreneurial? Check out a book on how to start a business or connect with a business mentor online using a public computer. Lost? Maps, directions, career resources, self-help books — libraries can help you find the way. Truly, the library has it all. What can you expect from Fast Forward Libraries? I hope to use this platform to bring innovative ideas about library capacity building to anyone interested. I’m always reading articles about individual and organizational development and I can’t help but think about how to use these ideas in a library setting. I want to share these ideas with you. Interested in learning more? Please sign up for my newsletter. I promise to only send content that will help your consider new ways to improve your library. I hope you’ll find my perspective interesting and think about how your library can be a Fast Forward Library.